With north facing views to die for, a secluded beach on your door step, and a flexible bed configuration catering for different groups, The Beach House is one of our most popular properties. It spans 3 levels and is positioned perfectly on the sought after Orion Beach stretch of Elizabeth Drive. Please ignore the "Average Nightly Rate". 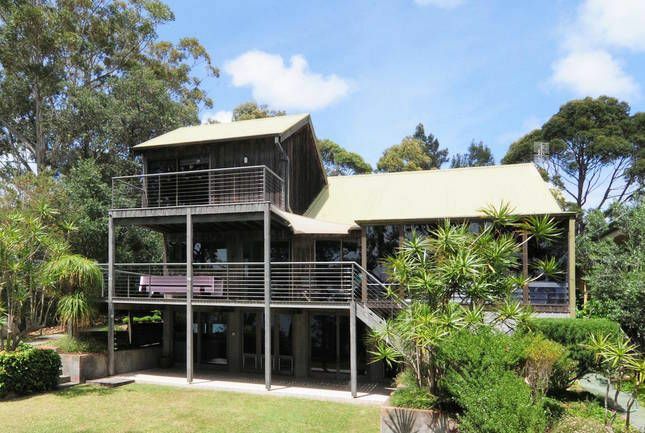 Jervis Bay Rentals rates are calculated as a high fixed amount ("Property fees") followed by a much lower nightly rate. This allows you to add extra nights to your stay without adding too much to the total tariff (the longer you stay, the lower the average nightly rate). Unfortunately HomeAway doesn't compensate for the fixed amount in their calculation of the "Average" nightly rate. We apologise for this, and hope it will be corrected soon. If you don't hear from us, we ask that you don't arrive before 3pm on the day of your booking (where the property has been cleaned and is ready before 3pm we will let you know that you can check in early). Departure is strictly 10am so that the cleaners have time to prepare the property for the next guests. This property is surrounded by permanent residents and is located in a quiet part of town. Guests that don't respect the neighbours will be evicted forfeiting their full tariff and bond. If you are planning a party, please look elsewhere as we have a zero tolerance policy. The kitchen has all the pots, pans and utensils you are likely to need. There is "Spray and Wipe", detergent, dishwashing tablets and dishcloths available as well as cleaning equipment for the BBQ. We also supply items like Gladwrap, foil, paper towels and tea towels. The pantry has all the basics (and often more!) including olive oil, salt and pepper, tea bags, coffee and sugar. Please be aware that ADSL (fixed line broadband) internet connections are very unreliable and speeds are significantly slower than metropolitan areas. Unfortunately we have no control over this. There is extensive coverage of Telstra's 4G and 3G mobile network in the area if you wish to use your mobile phone. Where internet is advertised, we do our best to keep it online, however, please don’t plan your holiday around a reliable internet connection. Amazing location, great views from this spacious property. Plenty of room for two families and so close to beach. Would totally recommend staying here, this house has everything you need, very comfortable. We enjoyed our stay immensely. This is an amazing property in a stunning location. We stayed for a week and had everything we needed supplied. Great view, and the beach below the house was gorgeous. Our two familes had a lovely time an the Beach House in Vincentia, even if summer appears to have been delayed this year. What a great location - a few steps to what is almost a private beach. The house was well fitted out and had all the important kitchen utensils. There are a few friendly kookaburras that became part of the group by the end of the week. If I had one issue it would be the beds which were very soft but definitely we will be back. We held our small wedding in the backyard at the Beach House, and had some guests stay with us in both the Beach House and Bungalow. I heard so many comments from our guests about how amazing the house and view is. We stayed on for a few days with our two young girls and had a very relaxing holiday - the house (and Bungalow) is so well appointed, it exceeded our expectations. Having access to the beautiful beach at the end of the yard is fantastic.. feels like a private beach. Will definitely stay again - thank you!!! We got married this weekend and stayed at house with guests, interstate and overseas. Everyone loved the gorgeous house and surrounds with a walk to beach and shops. The house catered for everyone comfortably including children. Furnishings of high quality, nothing was too much trouble in arranging accomodation and asking for extras like high chair, porta cots. Highly recommended.